Introducing the DUORA 7 Dark Gun color is the new Latest Edition with a new design displaying an eye-catching “Dark Gun” color with contrasting highlights of white and fluorescent red, inherited from the first generation of Duora. Duora 7 features the Dual Optimum System, combining a box frame on one face of the racquet for high and fast clears, while an aero frame on the opposite face, for high- control returns. This new edition shaft is 10mm long in comparison to previous old version. 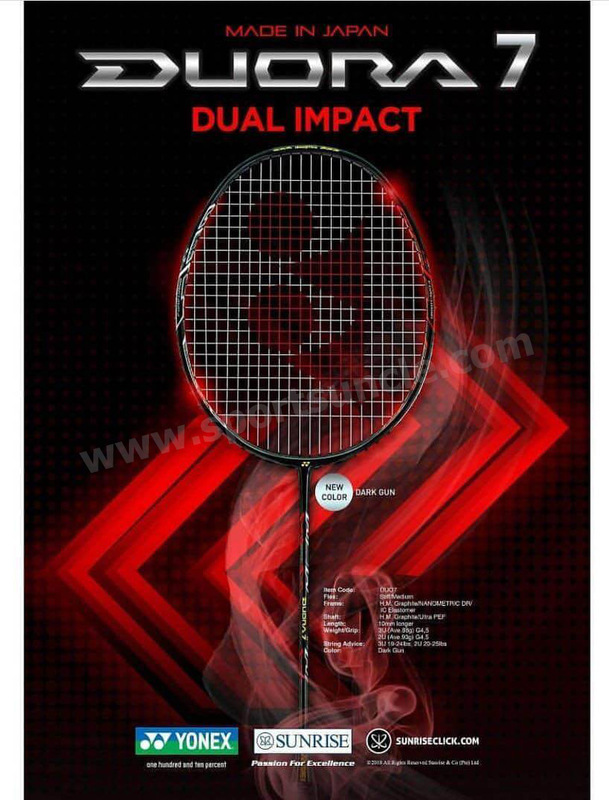 The racquet also introduces NANOMETRIC DR: A new carbon material developed by Yonex based on our unique NANOSCIENCE technology. Created from a material originally developed for next generation space aviation by Toray Industries, Inc., this marks the first time it has been used within the racquet industry. By combining firm shuttle hold and high repulsion, NANOMETRIC DR puts the DUORA into a class of its own. Combined with the ultra-resilient metal Ni-Ti Fiber, the DUORA is able to quickly shoot off the shuttle on returns. This Duora 7 New Color launched news published by us few months back.